My granddaughter and I share a passion for the color purple so I decided to make her a purple bed quilt for her fourth birthday. I occasionally make baby quilts and I try to keep them simple and utilitarian in hopes that they will be used and loved until there’s nothing left but scraps. But this quilt, I decided, was going to be big enough for her bed, and beautiful enough that she would love it forever. And of course, it had to be purple! I started the quilt at the September 2012 Quilt Inn Retreat and finished it just in time to hand deliver it to Adrienne on her birthday, mid-December. Adrienne can be a bit of a drama queen, but in this case, her reaction was just what I had hoped for: she threw her arms up into the air in delight, gasped dramatically, and then grabbed the quilt and proceeded to wrap it around herself and roll on the floor in delight. I alway tell her parents that they shouldn’t worry about the dramatics–she’s obviously in training to be Bette Midler when she grows up!!! 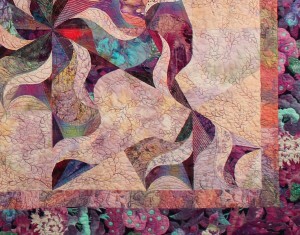 Here is a detail so you can see the quilting. Also note the narrow inner border. 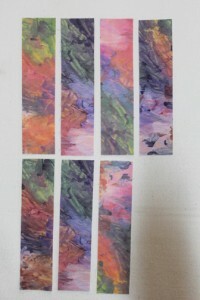 This is fabric I created from some of Adrienne’s artwork. I thought it would be cool to have something she created as part of her special quilt. 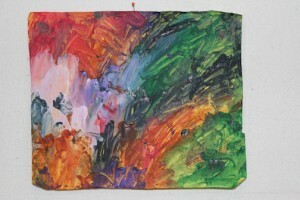 On the left, below, is the finger painting she did when she was about three year’s old. I was very taken with the way the colors are blended and the fact that she obviously took great care to fill the whole page with color. Most finger paintings I’ve seen consist of a few streaks of color on a white page, so I was impressed with her persistence, if nothing else! 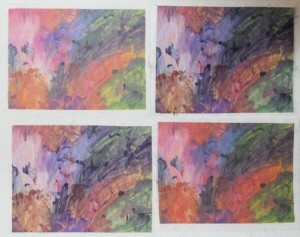 I scanned the painting into my computer and printed it onto fabric (above right). The fabric is prepared by backing it with something stiff. In this case I sprayed a piece of card stock with spray adhesive and adhered the fabric to it. The only hard part is making sure that the edges are clean with no threads or wrinkles that could jam the printer. Some of the printed fabric came out with more muted colors than the original painting, but that was OK because it worked well with the quilt. When the fabric was cut into strips, the difference in saturation just added variety. 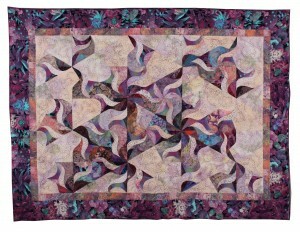 The colors worked perfectly with the other fabrics in the quilt. I stitched a sentence in that narrow border indicating that Adrienne’s artwork had been used to create that particular fabric. Hopefully she will come to me someday and ask exactly how that was done! It’s been a long time since I’ve made a bed quilt. This one is a bit sophisticated for a four-year-old, but I figure it’s never too early to expose children to beautiful things.I hope that she will keep this quilt for a long, long time and learn to appreciate it in different ways as time goes along. At least I got it finished BEFORE she decided that purple was no longer her favorite color!! This entry was posted on Wednesday, February 6th, 2013 at 11:24 pm and is filed under Uncategorized. You can follow any responses to this entry through the RSS 2.0 feed. You can leave a response, or trackback from your own site.